The embryonic stem cell (ESC) transcriptional and epigenetic networks are controlled by a multilayer regulatory circuitry, including core transcription factors (TFs), posttranscriptional modifier microRNAs (miRNAs), and some other regulators. However, the role of large intergenic noncoding RNAs (lincRNAs) in this regulatory circuitry and their underlying mechanism remains undefined. Here, researchers from the Second Military Medical University, China demonstrate that a lincRNA, linc-RoR, may function as a key competing endogenous RNA to link the network of miRNAs and core TFs, e.g., Oct4, Sox2, and Nanog. 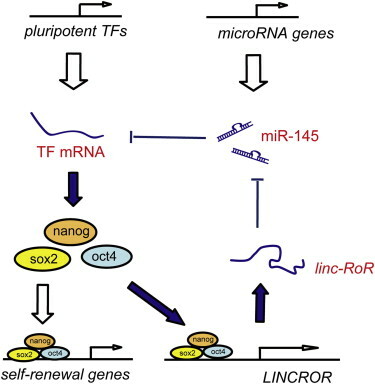 They show that linc-RoR shares miRNA-response elements with these core TFs and that linc-RoR prevents these core TFs from miRNA-mediated suppression in self-renewing human ESC. They suggest that linc-RoR forms a feedback loop with core TFs and miRNAs to regulate ESC maintenance and differentiation. These results may provide insights into the functional interactions of the components of genetic networks during development and may lead to new therapies for many diseases.